A Palestinian refugee and her child separated from their home by the “green line” after the 1948 war. That was no exaggeration. In the months that followed the birth of Israel — a birth midwifed by the United Nations but violently opposed by Arab governments — hundreds of thousands of Jews became refugees. Within the first years of Israel’s existence, once-vibrant Jewish communities in the Middle East and North Africa were decimated. In 1945, there were nearly 1 million Jews living in Arab lands. Today, there are almost none. 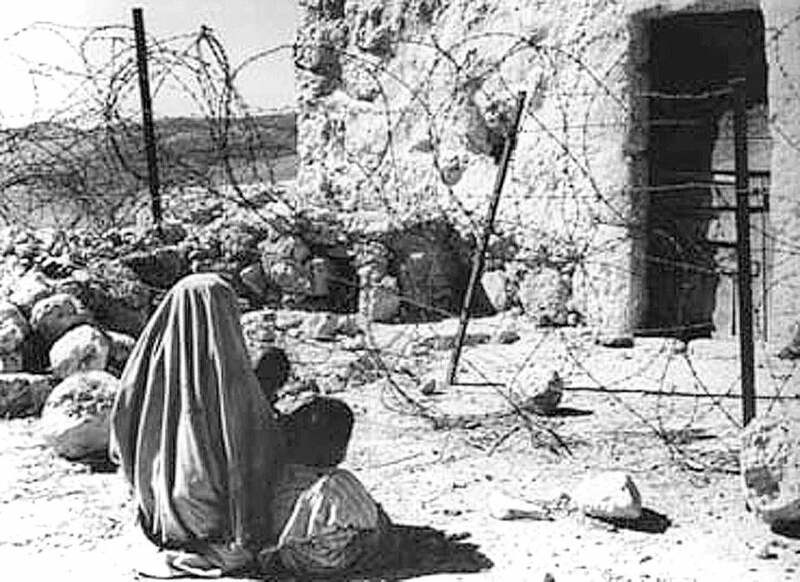 For the Palestinians, May 14, 1948 is remembered as the “Nakba” (Arabic for “catastrophe”) — the flight of 700,000 Arab refugees from Israel during the war that followed the creation of the Jewish state. The fighting was launched by the Arab League, whose armies invaded Israel within hours of its birth. The league’s secretary-general, Azzam Pasha, had declared that the Jews would be wiped out in “a war of extermination and momentous massacre,” but the fledgling state survived, and hundreds of thousands of Palestinians were displaced instead. Over the years, enormous attention has been paid to the issue of the Palestinian refugees. Even after seven decades, the topic remains raw and emotional. It is frequently said that there can be no lasting solution to the Arab-Israeli conflict until the plight of the Palestinian refugees is settled. To this day, the Palestinian Authority and Hamas claim a “right of return” for the original refugees and their descendants. More than 1.5 million Palestinians live in dozens of refugee camps administered by the United Nations, their predicament intensified by the refusal of every Arab country save Jordan to grant them citizenship. Generous refugee policy isn’t just a way to feel better. It’s a way for America to maintain its leadership in a dangerous world. Jews had been living in the Arab lands since time immemorial; in countries like Egypt, Iraq, and Libya, Jewish communities flourished centuries before the advent of Islam. Jewish life was integral to Middle East society, drawing on some of the world’s most ancient cultural roots. But with the rebirth of Jewish sovereignty in Palestine, antisemitic fury erupted across the region and those roots were ripped out. As the UN in 1947 debated whether to adopt the partition plan authorizing a Jewish state, Arab leaders had warned that violence against Jews would be uncontrollable. Addressing the UN General Assembly, the Egyptian ambassador Heykal Pasha threatened “the massacre of a large number of Jews” if the partition plan were adopted. In reality, the waves of expulsion and expropriation that ensued were orchestrated less by Arab mobs than by Arab governments, which passed harsh new laws stripping Jews of their property. In time, some 900,000 Jews were dispossessed or banished. Most of them made their way to Israel, which welcomed them as new citizens. Many had little more than the clothes on their backs; they had no choice but to rebuild their lives from scratch, while dealing with the trauma of upheaval and shattering loss as best they could. Fortunately for them, that’s what they were expected to do. Unlike Palestinian refugees, the Jews expelled from Arab countries were not encouraged to keep believing that they would return and reclaim their lost homes. They were not kept in refugee camps for decades, or denied the right to become citizens of countries that took them in. The grievous psychological injuries suffered by the Jewish refugees were allowed to heal. Not so the Palestinians. Their cynical leaders sought to keep their wounds festering, the better to exploit them as a political and propaganda tool against Israel. Jews and Palestinians weren’t the only refugees in the 1940s. Terror, poverty, and persecution put tens of millions of people to flight during and after World War II. Vast numbers of ethnic Germans were expelled after the war from the Soviet Union, Poland, and Czechoslovakia. The partition of the Indian subcontinent displaced 14 million men, women, and children. Driven by terrible circumstances, countless human beings had to run for their lives and start over in a strange land. Then as now, the best hope for refugees lies in resettlement, not in dreams of return. The Palestinian refugees’ worst catastrophe wasn’t displacement, a fate they have shared with much of mankind. It was being fed a lie — that the clock will be turned back, and the last 70 years undone. The grandchildren and great-grandchildren of the 1948 refugees, whether they live in Lebanon or Jordan, in America or the West Bank, are not refugees. They are at home. That is how they should think of themselves. That is how they should insist that the world think of them. No one is going back to the 1940s. Once Palestinians stop believing otherwise, the “nakba” will be at an end. The Jerusalem decision: welcome shift or dangerous provocation?